If you've been sorted into Hufflepuff, you don't need us to tell you all that's great about your house. You know all about fantastic beasts and powerful plants and you certainly aren't a "duffer," as Hagrid once put it. You're a fair, fun-loving, good-natured, down-to-earth little witch, and you just want everyone to get along and play by the rules. Is that so much to ask? We LOVE Hufflepuffs, and want you to wear your house colors with pride by slipping on this Harry Potter Hufflepuff Headband. In fact, we may get one ourselves and try to sneak into your absolutely charming common room to sip tea with you and talk about the mandrake crop. We don't have the password to get in, but we're hoping now that we've found this charming hair accessory for you, you may give us a hint or two! 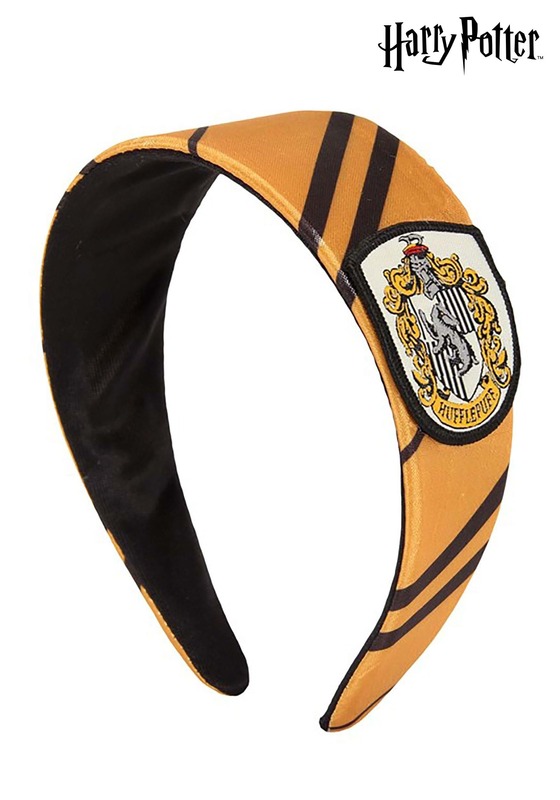 This is a simple and sweet headband in your house colors—yellow and black—featuring the Hufflepuff crest on one side. It will look smashing atop your school robes when you cheer on your Quidditch team, or as you pore over books in the library! One thing we can easily say about your Hufflepuffs—there's not a whole lot of darkness in you. You've produced almost no dark wizards, and you tend to be an altogether cheerful bunch of little badgers. Enjoy your moment to shine!